Veteran actress Sridevi passed away on Saturday night due to accidental drowning. Sridevi’s funeral was held at Vile Parle’s crematorium. The actress’ mortal remains were cremated as husband Boney Kapoor performed the last rites. Many celebrities had poured in to attend the funeral at the crematorium. Veteran actress Sridevi passed away on Saturday night due to accidental drowning. The unfortunate incident took place in Dubai where she was present to attend Mohit Marwah’s wedding. The mortal remains of the iconic star were brought to Mumbai on Tuesday night after getting clearance from Dubai police. Anil Kapoor and other members of the Kapoor family were present at the airport to receive the body. Sridevi’s funeral will be held at Vile Parle’s crematorium today around 3:30 pm. The actress’ body will be kept at her Green Acres house in Lokhandwala until then. Sridevi was with her husband Boney Kapoor and daughter Khushi Kapoor in Dubai when the shocking incident took place. She was 54. Sridevi’s death case was handed over to Dubai Public Prosecutor’s office. Soon after the investigation, the case was being closed. According to reports, the Public Prosecutor closed the case after declaring that it was natural death and head injury was seen but not cause of death. The body was kept at the Bhagya Bungalow and reached Mumbai in a private jet for public darshan and cremation. 5:24 pm: Sridevi’s mortal remain were cremated at the Vile Parle crematorium as Boney Kapoor performed the last rites. The funeral took place four days after her death on February 24, 2018. 5:15 pm: Sonam Kapoor has entered the crematorium. She was not present on the truck. Katrina Kaif has also reached. 5:10 pm: The mortal remains have been carried inside the crematorium and the last rites will begin any minute. 5:01 pm: Mika Singh, Director Rohit Shetty, Vidya Balan, Sidharth Roy Kapur, Aftab Shivdasani, Rahul Dev, Director Abhishek Kapoor reach to attend the last rites. 4:57 pm: Director Ramesh Sippy, Jahnvi Kapoor’s co-star Ishaan Khattar have arrived at the crematorium. 4:18 pm: Veteran actor Amitabh Bachchan has reached the crematorium. This is his first public appearance since the news of Sridevi’s demise was released. Javed Akhtar and Shabana Azmi along with Rani Mukherjee have also reached. 4:18 pm: Sunil Shetty, Fardeen Khan and Anupam Kher also present at the last rites. 4:01 pm: Lara Dutta and Mahesh Bhupathi reached the crematorium. Prasoon Joshi, Randhir Kapoor and bother Rajiv Kapoor, Farhan Akhtar, Dia Mirza along with husband Sahil Sangha have also reached. 3:59 pm: Shah Rukh Khan has reached the crematorium. 3:48 pm: Shakti Kapoor, Anil Ambani, Arjun Rampal, Rajpal Yadav, Saroj Khan, Chunkey Pandey, Satish Kaushik and Abbas-Mastan have reached the crematorium as per reports. 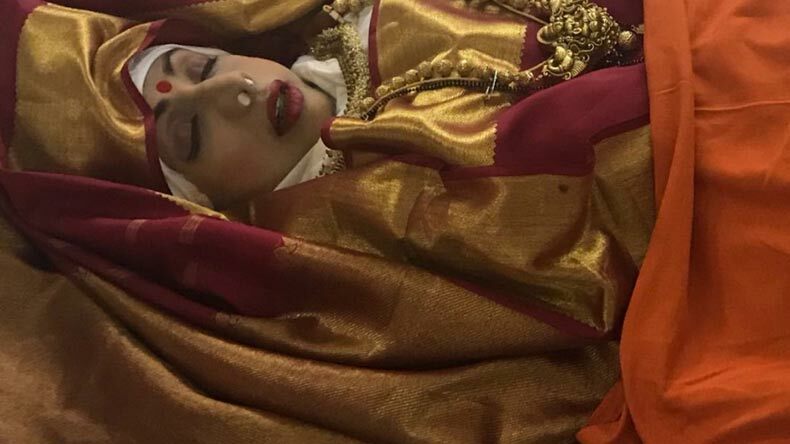 2:15 pm: Mortal remains of legendary actress Sridevi wrapped in tricolour. Entire family present at Celebrations Club, Mumbai. The truck which carries her mortal remains is decorated with white flowers with her picture in the front of the truck. Boney Kapoor, Jhanvi Kapoor, Arjun Kapoor, Anil Kapoor, Harshvardhan Kapoor and Mohit Marwah are also present on the truck. The truck will go from Andheri Lokhandwala to the crematorium in Vile Parle. 2:00 pm: The legendary actress is draped in her favourite red and golden Kanjivaram saree and has been covered in a glass box for fans to be able to see her glimpse for the last time and pay their tribute to the veteran star. Paid my last respects to Sridevi. The entire industry was there grieving, some on the verge of breakdown. Such was her aura & magic in films. She lay there, beautiful in a red saree, serene in death & totally at peace. ? 1:30 pm: The crowd is becoming unmanageable outside Celebration Sports Club for the police and the security personnel. There are around 7,000 fans outside the venue. Police and the traffic crew are asking people to not crowd the gates before the body leaves the club. 1:15 pm: Filmfare has shared pictures of the truck on which legendary actor Sridevi’s mortal remains will be carried to the crematorium in Vile Parle where the cremation will take place around 3:30 pm. 1:10 pm: Deepika Padukone, Sophie Chaudhary, Shahid Kapoor and his wife Mira Rajput and directors Rakesh Roshan and David Dhawan arrive at Celebration Sports Club to pay respects. 01:00 pm: Fardeen Khan, Vivek and Suresh Oberoi, Chiranjeevi, Venkatesh, Himesh Reshammiya, Malaika Arora, Patralekha, Ramesh Sippy, Kiran Juneja, Tisca Chopra arrive at Celebration Sports Club in Lokhandwala to pay respect to the late actress. 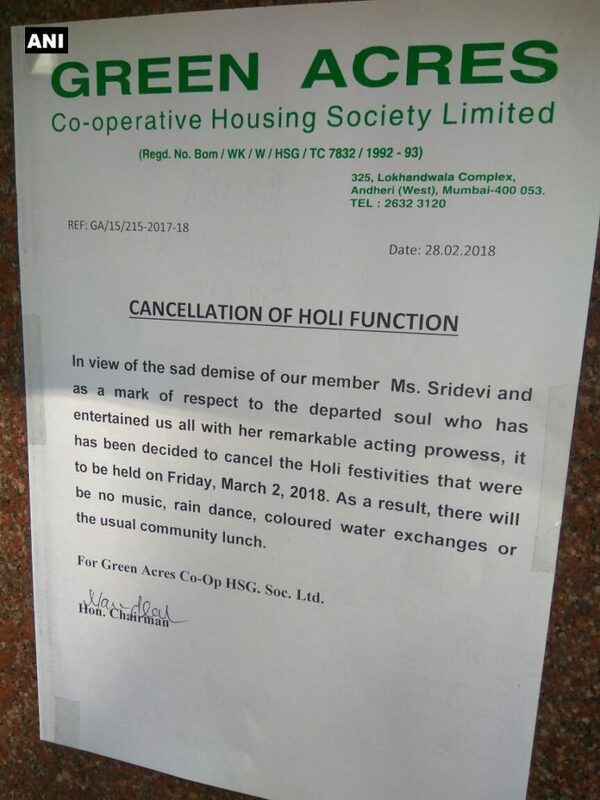 12:40 pm: As a mark of respect to Sridevi, the Green Acres Co-op housing society — where the late actor shared a home with husband Boney Kapoor and their two daughters — have cancelled their Holi celebrations. 12:30 pm: Bollywood actresses such as Neha Dhupia, Karishma Kapoor, Soha Ali Khan reach Celebration Sports Club in Lokhandwala. Bollywood actor Sidharth Malhotra also arrives at the venue in order to pay last respect to veteran actress Sridevi. 12:15 pm: Mumbai Police band and guards arrive at Celebration Sports Club in Lokhandwala as iconic star and Padma Shree awardee Sridevi will be given the State of Honour. Her body will be wrapped in Tricolour and respect will be given to her as a national asset. 12:00 noon: Filmmaker Sanjay Leela Bhansali, Sajid Khan, veteran actor Jackie Shroff and Rajkumar Rao arrive at Celebration Sports Club in Lokhandwala to pay the last respect to the iconic star Sridevi. 11:50 am: Padmashree Sridevi will be given State of honour. Will be honoured with a gun salute and the body is draped in the national flag. The cremation will take place in the afternoon. 11:30 am: Vidya Balan, Siddharth Roy Kapur, Jacqueline Fernandez, Shraddha Kapoor, Rekha and John Abraham arrive at Celebration Sports Club in Lokhandwala to pay the last respect to the queen of Indian cinema. 11:10 am: Bollywood actress Sonal Chauhan, filmmaker Subhash Ghai and actor Ravi Kishan arrive at Celebration Sports Club in Lokhandwala to pay the last respect to veteran actress Sridevi. The cremation will take place in the afternoon at Vile Parle’s crematorium. 11:00 am: Bollywood actor Ajay Devgn, wife Kajol reach the Celebration Sports Club in Lokhandwala. Also, choreographer Saroj Khan, who choreographed Sridevi in many films arrives at the venue. Veteran actress Jaya Bachchan has also reached Celebration Sports Club. 10:45 am: Madhuri Dixit Nene, along with her husband Dr Madhav Nene arrives at the Celebration Sports Club in Lokhandwala to pay the last tribute to the iconic star. The cremation will take place in the afternoon. 10:30 am: Aishwarya Rai Bachchan and Sushmita Sen arrive at the Celebration Sports Club in Lokhandwala to pay their last respect to veteran actress Sridevi. 10:20 am: Sridevi’s family including brother-in-law Sanjay Kapoor, Rhea Kapoor & Harshvardhan Kapoor arrive at Celebration Sports Club. Fashion photographer Dabboo Ratnani has also arrived at the venue. 10:10 am: Bollywood celebrities like Hema Malini, Esha Deol, Nimrat Kaur, Maniesh Paul and Satish Kaushik arrive at Celebration Sports Club in Lokhandwala to pay their last respect to veteran actress Sridevi. 10:00 am: There is a long queue of fans outside Celebration Sports Club in Lokhandwala as they are waiting to catch a glimpse of their favourite actress. A heavy crowd has gathered outside Celebration Sports Club in Lokhandwala. 9:45 am: Bollywood actress Sonam Kapoor along with her beau Anand Ahuja and filmmaker Farah Khan arrive at the Celebration Sports Club in Lokhandwala to pay the last respect to the queen of Indian cinema, Sridevi. 9:30 am: Actor Annu Kapoor has arrived at Celebration Sports Club in Lokhandwala and the latter told the media that its a very difficult time for the family as the daughters have lost their mother at such a young age and therefore we should pray for them. 9:20 am: Bollywood actor Arbaaz Khan has reached Celebration Sports Club in Lokhandwala to pay tribute to the late actress. Sridevi’s funeral will be held at Vile Parle’s crematorium today around 3:30 pm. 9:05 am: Bollywood actor Anil Kapoor leaves arrives at Celebration Sports Club in Lokhandwala. Sridevi’s mortal remains have reached Celebration Sports Club for fans to pay last tribute to the late actress. 9:00 am: Residents from Sridevi’s native village Meenampatti in Sivakasi have expressed their sorrow and grief over Sridevi’s sudden and unfortunate death. Said that they cannot believe that Sridevi has passed away. 8:45 am: Family members, including her filmmaker husband Boney Kapoor and stepson Arjun Kapoor, accompanied the body from the morgue to get it embalmed before heading for the Dubai airport on her final journey home. 8:30 am: Jatin Valmiki, a visually impaired man from Uttar Pradesh has been waiting outside Sridevi’s residence since morning as the actress helped him financially for his brother’s brain tumour operation. 8:15 am: Both sides of the road which lead to Sridevi and Boney Kapoor’s Green Acres residence in Lokhandwala are heavily crowded with her fans and some even climbing the trees to have a single glimpse of the iconic star as her last rites are going to take place shortly. 7:45 am: According to an official statement by Mumbai police, around 250 cops are deployed today at the house where her body will be kept for paying final tribute and last respect to the queen of Indian cinema. 7: 30 am: Many police officials have been placed outside Sridevi’s Green Acres residence and cordoned off the area so as to keep the situation under control. Heavy security has also been deployed outside Mumbai’s Celebration Sports Club, where Sridevi’s mortal remains will be kept for people to pay last respect. 7: 15 am: In a previous statement, the family said that Sridevi’s body will be kept at Celebration Sports Club in Lokhandwala near her home for fans and media to pay their last respects from 9. 30 a.m. to 12.30 p.m. today before it is taken for cremation. 7:00 am: Fans have gathered outside Sridevi’s’Green Acres’ residence to pay last respect to the iconic star and are waiting to get a glimpse of the late actress. Earlier, Bollywood actor Salman Khan had visited Boney Kapoor residence around midnight after Sridevi’s mortal remains had reached home.